A crew access arm reaches toward SpaceX's first Crew Dragon spacecraft atop its Falcon 9 rocket on Launch Pad 39A of NASA's Kennedy Space Center in Cape Canaveral, Florida on Jan. 3, 2019 ahead of an uncrewed test flight. 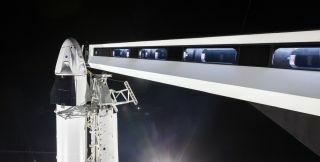 The private spaceflight company SpaceX has moved its first Dragon spaceship designed for astronauts to the launchpad ahead of an uncrewed test flight that's just weeks away. SpaceX rolled the Crew Dragon and its Falcon 9 rocket out to the historic Launch Pad 39A at NASA's Kennedy Space Center in Cape Canaveral, Florida Thursday (Jan. 3) for a test flight for NASA targeted for Jan. 17 . That schedule, however, may be delayed due to the ongoing partial government shutdown that has shuttered much of the U.S. space agency. If all goes well with the uncrewed test, SpaceX will launch its first crewed flight with NASA astronauts Bob Behnken and Doug Hurley. That flight was previously scheduled for June of this year. SpaceX's first Crew Dragon and its Falcon 9 rocket stand atop Launch Pad 39A of NASA's Kennedy Space Center in Cape Canveral, Florida ahead of an uncrewed test flight scheduled for January 2019. New SpaceX photos show the first Crew Dragon attached to its rocket in their hangar at Launch Pad 39A, as well as rolling out to the pad, standing upright in launch position and sitting within reach of the company's sleek white and black crew access arm. A look at SpaceX's first Crew Dragon spacecraft attached to its Falcon 9 rocket as both sit inside their hangar at Launch Pad 39A of NASA's Kennedy Space Center in Cape Canaveral, Florida in January 2019. The Hawthorne, California-based SpaceX is one of two companies contracted by NASA to ferry astronauts to and from the International Space Station under the agency's Commercial Crew program. The other company is Boeing, which has its own crewed ship for NASA, called the CST-100 Starliner, that is scheduled to make an uncrewed test flight in March, with crewed flight later this year. A SpaceX Falcon 9 rocket carrying the company's first Crew Dragon spacecraft rolls out of its hangar at Launch Pad 39A of NASA's Kennedy Space Center in Cape Canaveral, Florida on Jan. 3, 2018. Like SpaceX's uncrewed Dragon ships, the Crew Dragon will launch on the company's workhorse Falcon 9 rocket. The spacecraft is designed to fly up to seven astronauts to and from low-Earth orbit. It will use parachutes to splash down in the ocean, also like the uncrewed Dragon. SpaceX is also developing a larger crewed spacecraft, called Starship, as part of its effort to eventually fly people to Mars. That reusable spacecraft will be able to carry about 100 people on deep-space flights, and will launch on a massive rocket (called the Super Heavy) that is also designed to be reusable, Musk has said. A "hopper" prototype for the Starship vehicle will undergo test flights at SpaceX's newest launch site near Brownsville. Musk said those tests could begin in the next few months. SpaceX has already booked its first passenger for Starship, Japanese billionaire Yusaku Maezawa, who hopes to fly artists around the moon on the vehicle in the mid-2020s.